The 200 metres (also spelled 200 meters) is a sprint running event. On an outdoor race 400 m track, the race begins on the curve and ends on the home straight, so a combination of techniques are needed to successfully run the race. A slightly shorter race, called the stadion and run on a straight track, was the first recorded event at the ancient Olympic Games. The 200 m places more emphasis on speed endurance than shorter sprint distances as athletes predominantly rely on anaerobic energy system during the 200 m sprint. In the United States and elsewhere, athletes previously ran the 220-yard dash (201.168 m) instead of the 200 m (218.723 yards), though the distance is now obsolete. The standard adjustment used for the conversion from times recorded over 220 yards to 200 m times is to subtract 0.1 seconds, but other conversion methods exist. Another obsolete version of this race is the 200 metres straight, which was run on tracks that contained such a straight. Initially, when the International Amateur Athletic Association (now known as the International Association of Athletics Federations) started to ratify world records in 1912, only records set on a straight track were eligible for consideration. In 1951, the IAAF started to recognise records set on a curved track. In 1976, the straight record was discarded. The race attracts runners from other events, primarily the 100 metres, wishing to double up and claim both titles. This feat has been achieved by men eleven times at the Olympic Games: by Archie Hahn in 1904, Ralph Craig in 1912, Percy Williams in 1928, Eddie Tolan in 1932, Jesse Owens in 1936, Bobby Morrow in 1956, Valeriy Borzov in 1972, Carl Lewis in 1984, and most recently by Jamaica's Usain Bolt in 2008, 2012, and 2016. The double has been accomplished by women seven times: by Fanny Blankers-Koen in 1948, Marjorie Jackson in 1952, Betty Cuthbert in 1956, Wilma Rudolph in 1960, Renate Stecher in 1972, Florence Griffith-Joyner in 1988, and Elaine Thompson in 2016. Marion Jones finished first in both races in 2000 but was later disqualified and stripped of her medals after admitting to taking performance-enhancing drugs. An Olympic double of 200 m and 400 m was first achieved by Valerie Brisco-Hooks in 1984, and later by Michael Johnson from the United States and Marie-José Pérec of France both in 1996. Usain Bolt is the only man to repeat as Olympic champion, Bärbel Wöckel (née Eckert) and Veronica Campbell-Brown are the two women who have repeated as Olympic champion. The men's world record holder is Usain Bolt of Jamaica, who ran 19.19s at the 2009 World Championships. The women's world record holder is Florence Griffith-Joyner of the United States, who ran 21.34s at the 1988 Summer Olympics. The reigning Olympic champions are Usain Bolt and Elaine Thompson (Jamaica). The reigning World Champions are Ramil Guliyev (Turkey) and Dafne Schippers (the Netherlands). Races run with an aiding wind measured over 2.0 metres per second are not acceptable for record purposes. Only the fastest time for each athlete is listed. Usain Bolt also ran 19.30 (2008), 19.32 (2012), 19.40 (2011), 19.55 (2015), 19.56 (2010), 19.57 (2009), 19.58 (2012), 19.59 (2009), 19.63 (2008), 19.66 (2012, 2013), 19.67 (2008). Yohan Blake also ran 19.44 (2012), 19.54 (2012). Tyson Gay also ran 19.62 (2007). Michael Johnson also ran 19.66 (1996). Noah Lyles also ran 19.67 (2018). Correct as of August 2018. Florence Griffith-Joyner also ran 21.56 (1988), 21.76 (1988), 21.77 (1988). Merlene Ottey also ran 21.66 (1990), 21.77 (1993). Marita Koch also ran 21.76 (1982), 21.78 (1985). Marion Jones also ran 21.76 (1997). Gwen Torrence also ran 21.77 (1995). Elaine Thompson also ran 21.78 (2016). Silke Gladisch also ran 21.79 (1987). Frankie Fredericks also ran 20.10 (1999), 20.18 (1999). Wallace Spearmon also ran 20.10 (2005), 20.19 (2008), 20.21 (2005). Divine Oduduru also ran 20.18 (2018), 20.21 (2018). Irina Privalova also ran 22.15 (1993), 22.16 (1994), 22.26 (1992), 22.32 (1995), 22.36 (1992), 22.41 (1991), 22.45 (1991). Merlene Ottey also ran 22.24 (1991), 22.34 (1989), 22.37 (1991). Veronica Campbell-Brown also ran 22.43 (2004). ^ "Converting Times from English to Metric Distances". National Federation of State High School Associations. Archived from the original on 16 March 2008. Retrieved 26 December 2007. 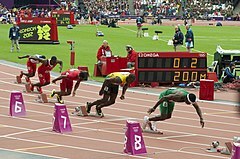 ^ "Men's outdoor 200 Metres | Records". iaaf.org. IAAF. Retrieved 12 December 2018. ^ "Women's outdoor 200 Metres | Records". iaaf.org. IAAF. Retrieved 12 December 2018. ^ "All-time men's best 200m outdoor". alltime-athletics.com. 1 September 2018. Retrieved 3 September 2018. ^ Layden, Tim (31 August 2009). "Bolt Strikes Twice". si.com. Sports Illustrated. Retrieved 5 December 2018. ^ "Yohan Blake and Usain Bolt star in Brussels". bbc.com. BBC. 16 September 2011. Retrieved 13 December 2018. ^ "200m Dash Results". flashresults.com. 28 June 2015. Retrieved 28 June 2015. ^ "200m Results" (PDF). sportresult.com. 20 July 2018. Retrieved 1 August 2018. ^ "200m Semifinal 1 Results". asaseniors18.co.za. 16 March 2018. Retrieved 17 March 2018. ^ Roy Jordan (9 July 2016). "Rollins wins 100m hurdles showdown at US Olympic Trials". IAAF. Retrieved 9 July 2016. ^ Brent Stubbs (7 April 2018). "Gardiner Breaks 200m National Record In Miami". tribune242.com. Retrieved 13 April 2018. ^ "200m Men Final Results" (PDF). EAA. 9 August 2018. Archived from the original (PDF) on 3 August 2016. Retrieved 11 August 2018. ^ Jon Mulkeen (21 April 2019). "Norman blazes 43.45 400m at Mt SAC Relays, Crouser blasts 22.74m shot put at Long Beach". IAAF. Retrieved 22 April 2019. ^ "Meeting Madrid 2017 Results" (PDF). RFEA. 14 July 2017. Retrieved 15 July 2017. ^ "200m Semifinal 1 Results" (PDF). results.toronto2015.org. 23 July 2015. Retrieved 25 July 2015. ^ "Men's 200m Semifinal 2 Results" (PDF). Rio 2016 official website. 17 August 2016. Archived from the original (PDF) on 20 September 2016. Retrieved 18 August 2016. ^ "All-time women's best 200m outdoor". IAAF. Retrieved 11 August 2018. ^ a b "200m Results". IAAF. 28 August 2015. Retrieved 28 August 2015. ^ Ed Gordon (1 July 2012). "Marritt hurdles world-leading 12.93, Felix blazes 21.69 in Eugene – U.S. Olympic Trials, Day 7". IAAF. Retrieved 1 July 2012. ^ "200m Results". IAAF. 27 May 2017. Retrieved 27 May 2017. ^ "200m Results" (PDF). sportresult.com. 24 August 2017. Retrieved 25 August 2017. ^ "Women's 200m Results" (PDF). European Athletics. 11 August 2018. Archived from the original (PDF) on 3 December 2016. Retrieved 12 August 2018. ^ "Records & Lists - All Time Top Lists - Senior Indoor 200 Metres Men". iaaf.org. IAAF. Retrieved 24 February 2019. ^ a b c d e Roy Jordan (10 March 2018). "Norman breaks world indoor 400m record at NCAA Indoor Championships". IAAF. Retrieved 12 March 2018. ^ Don Williams (23 February 2019). "Texas Tech men win Big 12 track title in a runaway". lubbockonline.com. Lubbock Avalanche-Journal. Retrieved 24 February 2019. ^ a b c d Jon Mulkeen (12 March 2017). "Coleman speeds to sprint double at NCAA Indoor Championships". IAAF. Retrieved 12 March 2017. ^ a b "200m Dash Results". ncaa.com. 14 March 2015. Retrieved 15 March 2015. ^ "Indoor round-up: Combined events world leads for Van der Plaetsen and Maudens, Mihambo leaps 6.99m in Berlin". IAAF. 2 February 2019. Retrieved 9 February 2019. ^ "200m Dash Results". ncaa.com. 11 March 2017. Retrieved 12 March 2017. ^ "All Time Top Lists - Senior Indoor 200 Metres Women". iaaf.org. IAAF. Retrieved 12 December 2018. ^ "200m Results". ncaa.com. 11 March 2017. Retrieved 12 March 2017.